Since I am always mentioning my breakfast I thought I would take a picture of it today. Ta da! 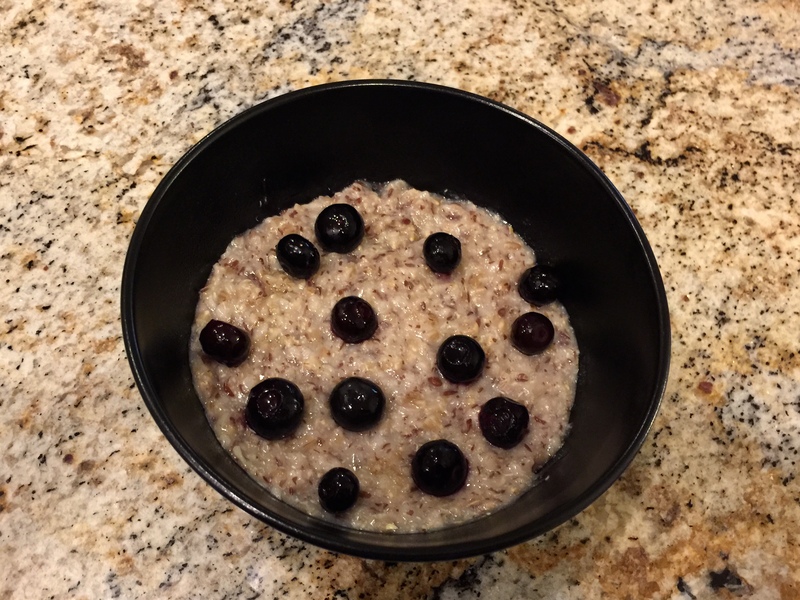 Steel cut oatmeal with flaxseed and blueberries. I am still missing all the other breakfasts I used to have and feel a little rebellious about having to eat it every day. Plus it looks like my countertop!!! On to why I had pasta twice today. First, I love pasta. It fits into my part-time vegan eating plan and I have been eating the healthy whole grain type. Second, at lunchtime John and I had not discussed the all important “What do you want for dinner” question. 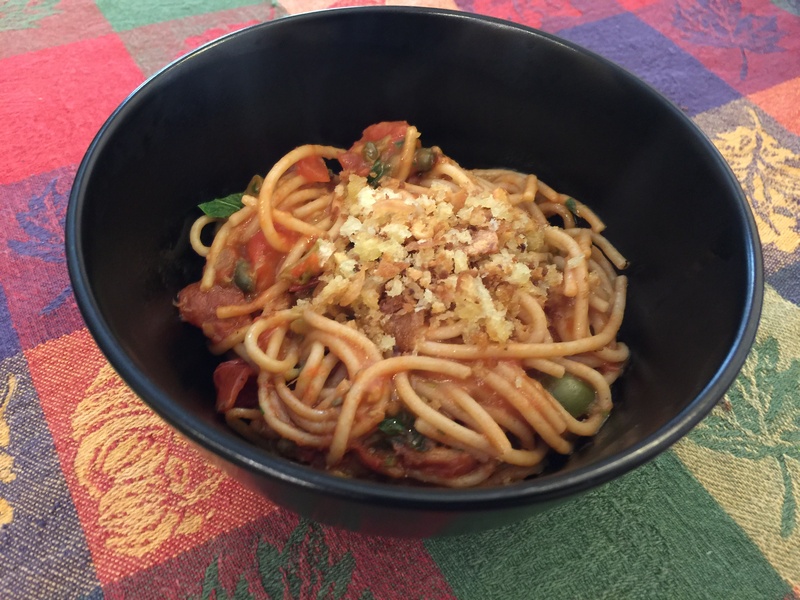 So I blithely took out the leftovers of the pasta with olives, capers, and tomatoes that I made on Sunday and ate them for lunch. So John is concerned that we still have a whole lot of turkey leftovers and he wants to make a gigantic soup. I am not enthused. I suggest cutting off some cutlet type pieces and making turkey parmesan with spaghetti and salad. I win! I expect we will be having the aforementioned turkey soup sometime later this week. 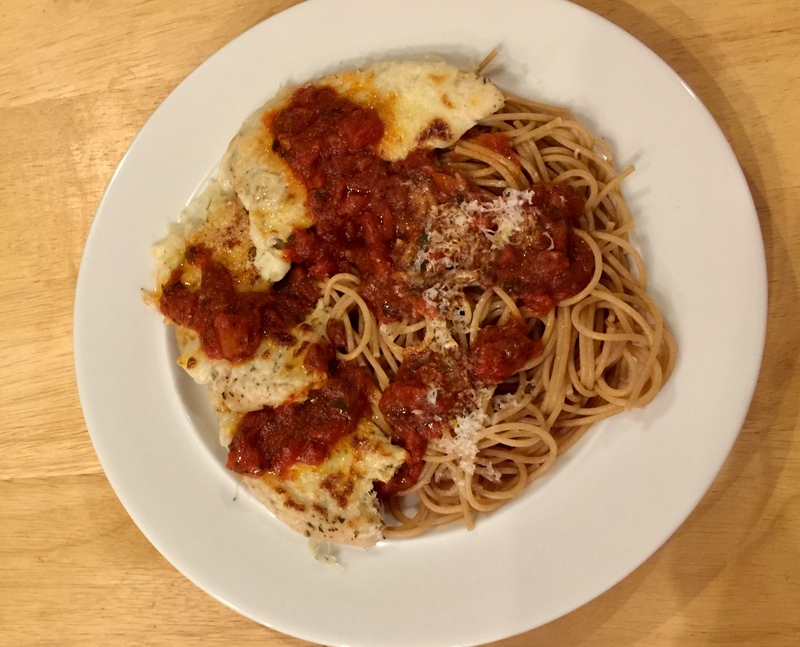 This entry was posted in Grains, leftovers, Pasta, Poultry, Vegan, Vegetables, Vegetarian and tagged blueberries, flaxseed, leftovers, Oatmeal, parmesan, Spaghetti, Turkey. Bookmark the permalink.